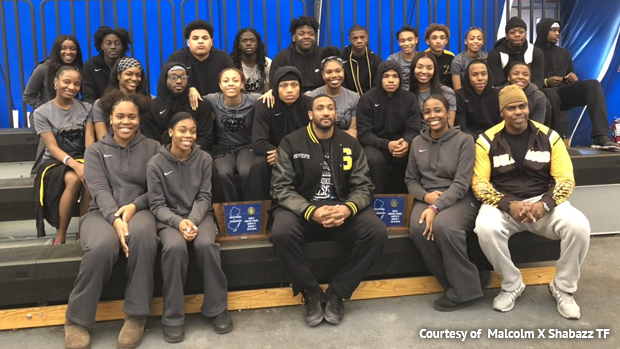 On Sunday, February 3rd, Malcolm X Shabazz boys and girls not only swept the North 2 Group 1 Sectionals but made school history in the process. That was the first Sectional title for both squads the girls scoring a whopping 73 points and the boys 66 in a close one with Whippany Park and McNair Academic who totaled 61. The girls had this one locked up before we even reached the 4x400m, and had a convincing lead before the 3200m hit the track. There was almost a competition of sorts within their own team on who could score the most points, Anyae Simmons and Vernetta Gosier had multiple medals on the night. The girls opened the meet with a 2-3-5 finish in the 400m thanks to Simmons 1:03.85, Gosier 1:03.92, and DeWitt 1:04.40. This was followed by a Gosier win in the hurdles at 8:93 and a bronze by Simmons 9.35. Simmons then won the 55m dash running 7:37 with Gosier second at 7:50. To finish off the track portion of the meet they won the 4x400m running 4:22.05, and you guessed it Simmons and Gosier were also on that along with Nashauna Johnson and Shawnaeja Dewitt. They also had medal support from their field athletes, Maha Kalonji cleared 4-10 in the high jump for second and Shelby Kemp was sixth in the shot put throwing 28-02.75. The boys meet was anything but decided as we entered the last event of the meet. With the 4x400m still to go Shabazz had a one point lead on McNair Academic 56 to 55 and Whippany Park was right behind in third at 53. The battle raged on in the relay event and Shabazz clinched the win with a win running 3:39.57. Whippany Park was right there with a 3:40.82 and McNair third 3:45.36. Shabazz finished with 66 points, Whippany Park and McNair Academic tied for second at 61 points a piece. Shabazz senior Justin Eastman certainly had himself a day, he won the 400m running 52.71, was second in the 55m dash 6.67, and cleared 6-0 in the high jump for second, and had a hand in their winning 4x400m as well. Also in the 55m dash Byron Whithead and Curtis Woodard crossed second and sixth, the 800m saw Maki Davis place third, 2:07.27, Shakur Williams fifth in the hurdles, 9:40, Whithead also cleared 5-10 for third in the high jump, and they gathered a 3-4-6 finish in the shot put thanks to Antonio Williams 41-09, Elliot Imeudia 41-1, and Khaleem Lawson 40-03.5. 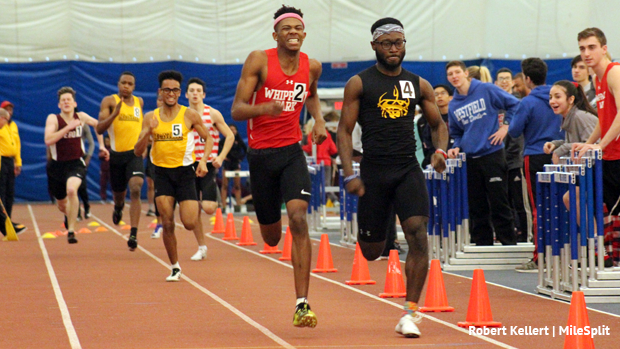 Other highlights included... Zachary Debelak of Glen Ridge winning the 55m dash at 6.66. McNair Academic's Marcus Hardy took the 800m at 2:00.13 after also place in the 400m, Hamza Barkouch had a great meet as well winning the 1600m and 3200m at 4:25.44 and 10:14.23 and was second in the 800m, 2:06.18. 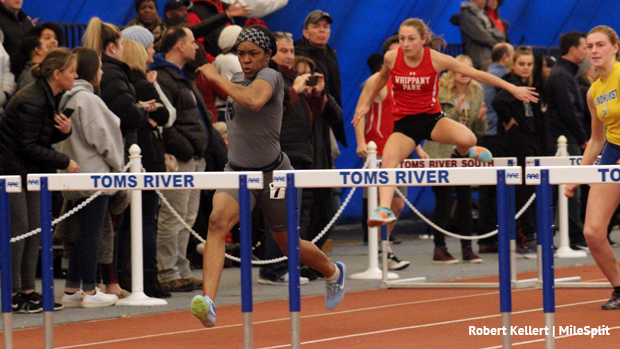 Whippany Park's Christian Martin ran 7.87 in the 55m hurdles win. 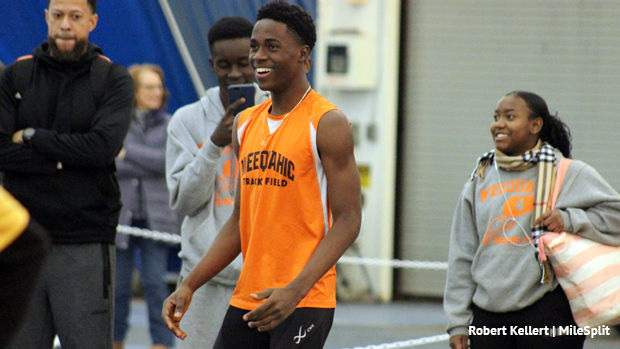 Foluso Adedeji of Weequahic cleared 6-05 in the high jump for a meet record, Owen Fogarty of Verona won the pole vault at 13-03, and Issac Skrivanic 47-08 to take the shot put. On the girls side Kathleen Ashley of Verona won the 800m running 2:25.04, Claire Chapeau of McNair had two golds winning the 1600m, 5:27.17, and 3200m, 11:46.76. Jasleen Nanda of Palisades Park cleared 4-10 to win the high jump, Alexa Schauder 8-06 in the pole vault, and Felicia Johnson of Science Park threw 34-05.75 in the shot.